The St. Matthew Passion was first performed in 1727 at the St. Thomas Church in Leipzig. Considering it his most significant work, Bach revised the piece in 1736 and twice during the early 1740s. Nonetheless, it was shelved after its initial performances and promptly neglected, as was customary for music of the day. The passion received a second premiere of sorts in 1829 when the 19-year-old Felix Mendelssohn organized a performance and conducted the work for the first time since Bach did so himself, albeit in an abbreviated and modified form. The performance was a great success, and this triumphant revival of a historical work did much to establish the modern-day notion of “classical music.” Bach's St. Matthew Passion has since remained one of the monuments of the literature. Essentially a form of interactive theater, the St. Matthew Passion depicts the final sufferings and crucifixion of Jesus Christ. It sets chapters 26 and 27 of the Gospel of Matthew to music, sung in recitative by the various characters portrayed within the text. This is interspersed with personal reflection on the biblical verse, heard in Bach’s recitatives and arias set to a libretto by Picander, a contemporary of Bach. Mediating between the gospel and its commentary are the 15 chorales; these stem from the liturgy and serve as a community response to the unfolding events. The entire production involves a large cast of performers: two choirs, two orchestras, and multiple vocal soloists. The St. Matthew Passion is filled with multidimensional levels of symbolism, theological understanding, and psychological insight, and performances of the work can be deeply probing and, at times, wonderfully overwhelming. It is undoubtedly one of the most impressive examples of Christian artwork. 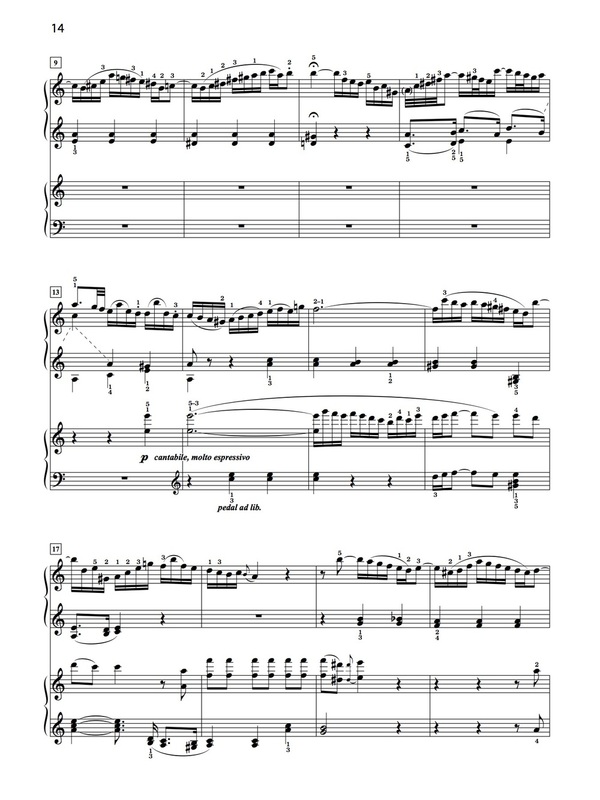 I wrote this arrangement for two pianos for one simple reason: I wished to play this awe-inspiring music myself. Five movements from the original work have been carefully selected; together they retain the dramatic arch of the story, but pare the music down to a more manageable duration suitable for performance on recitals. The three original arias—one each for solo alto, soprano, and bass, respectively—are in actuality duets of equal partnership between the vocal soloists and obbligato instruments. The counterpoint translates especially well to the two-piano medium. The two chorales in the arrangement serve the same purpose as they do in the original: they offer an alternative point of view, both musically and spiritually. My God, for my tears' sake! This aria was originally scored as a duet between alto voice and solo violin, accompanied by strings and continuo. Peter’s weeping is portrayed through the pervasive use of appoggiaturas, descending bass lines, and piercing dissonances, which in turn prompts us as listeners to take on Peter’s repentance as our own. How amazing is this punishment! The chorales would have been as familiar to the original churchgoers as nursery rhymes are to school children, though within the context of the passion, they surely would have carried an intensified meaning. 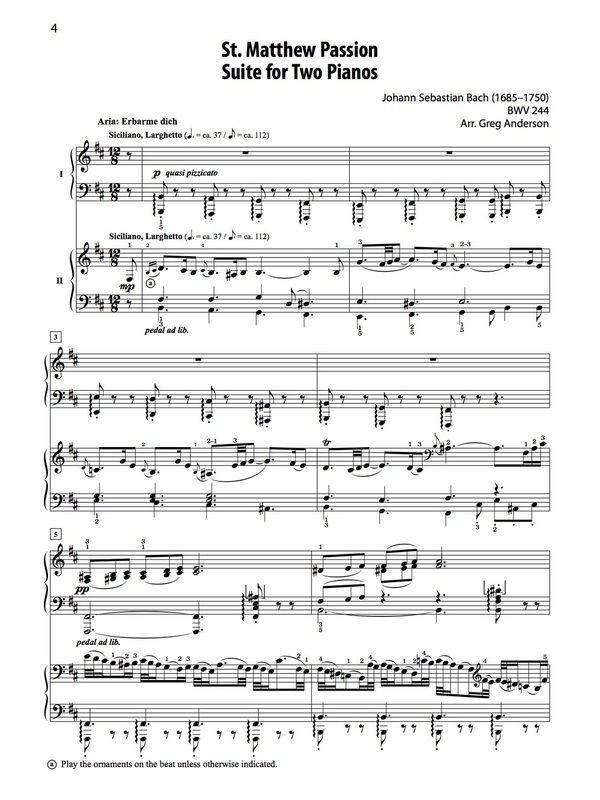 Johann Heerman wrote this particular hymn (“Herzliebster Jesu”) in 1630 and Johann Crüger wrote its tune 10 years later; the harmonization is by Bach. The chorale is notable for its chromaticism and unusually long musical phrases. May not rest upon my soul. Bach omits the usual strings and continuo to symbolize Christ’s otherworldly purity. “O Haupt voll Blut und Wunden” represents a low point of sorts, both in its uncompromising imagery and its placement within the narrative. The text and melody to this chorale have a tangled past that illustrates the free flow of artistic ideas throughout history. The hymn is based on a medieval Latin poem and was translated into German by the Lutheran hymnist Paul Gerhard in the mid-seventeenth century. The melody is by Hans Leo Hassler, written around 1600 for a secular love song, and later simplified by Johann Crüger to accompany Gerhard’s hymn. Bach once again re-harmonized the choral for its use in his passion. Ironically, the melody of Paul Simon’s “American Tune” is also based on the same German melody. World, leave my heart, and let Jesus enter! No longer anguished by Jesus’ suffering, we enter a state of mind wholly new, serene, and quietly euphoric. Salvation is indeed at hand. Structurally, both the St. Matthew Passion and this arrangement follow Martin Luther’s “A Meditation on Christ’s Passion,” written in 1519. Luther first asks the believer to repent his own guilt and show remorse (“Erbarme Dich”), then recognize that Christ suffered for our sins (the chorales) and that his love will conquer all (“Aus Liebe will mein Heiland sterben”). Having undertaken these earlier stages, the believer can finally accept Christ into his life and live following Christ’s example (“Mache dich, mein Herze, rein”). Audiences of this arrangement, however, are free to give the work new meaning. With a simplified instrumentation and no lyrics at hand, the music becomes abstract, reduced to its purest essence. The pianos’ monochromatic sonority and clarity of attack highlight the harmonic complexities within the music; the tormented dissonances become even more tangible. Words are no longer necessary: the music speaks for itself, with poignancy and intensity. Regardless of one’s religious beliefs, the St. Matthew Passion is a work of haunting beauty and emotional power, a work capable of inspiring self-reflection and personal growth. Though ostensibly about one man’s death, it is music that gives us a reason to live.